Last week I got into a discussion about which tools people use to manage their Twitter accounts. I use a combination because I haven’t found one program that does it all for me. Right now I use Tweetdeck to notify me when someone tweets me and to generally browse tweets, Twitter if I need a twitter handle that I can’t find, and Buffer to schedule tweets. It’s kinda complicated! I started using Tweetdeck because it was the first one that I heard about and started using, but after doing a quick survey on Facebook, it appeared that most people prefer Hootsuite. I’ve tried it and I don’t want to make the switch, but I thought I’d compare those two and then share two other tools that I’ve found myself using a lot. Brooke pointed out that it has a cute owl theme! Buffer is a tool that I found fairly recently. It doesn’t let you schedule tweets individually- instead you add posts to your “buffer,” and it distributes them at times that you set. It allows you 5 or 6 slots, and if you want more then you need to pay to upgrade. You also have the option of posting immediately. The reason why I am addicted to buffer is because it tracks the clicks on your links, and it tracks the potential views based on how many retweets each tweet has. As a statistics nerd, this was totally exciting to me. It also has a dashboard feature where you can click on any page and it will create the tweet for you, which I use a lot when I find a blog post that I like. I love it! Have you ever looked at the list of people you follow and felt like it was WAY too big, but had no idea where to start unfollowing people? 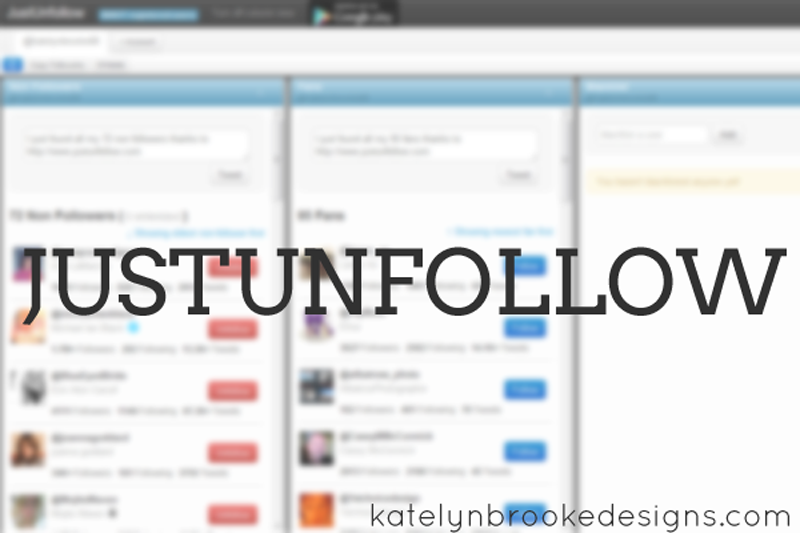 JustUnfollow is a tool that shows you all the people you follow don’t follow you back. Here’s the thing: it can feel kind of catty to look at it too much, so I recommend checking it sparingly. Oftentimes I’ll check it and not change a thing, because there are a lot of people that I follow that I don’t expect to follow me back. But you know what is my biggest Twitter pet peeve? When someone you don’t know follows you and you follow them back, and then a few days or a week later, they unfollow you. I totally understand following people because you want them to follow you back and you want to form a relationship with them; I do that a lot. But when someone follows you and then unfollows you as soon as you follow them, you wind up feeling a little used. This tool makes it so that you know exactly who those people are, and can stop following them if you want to. And it makes your Twitter stats look a little better because of it. 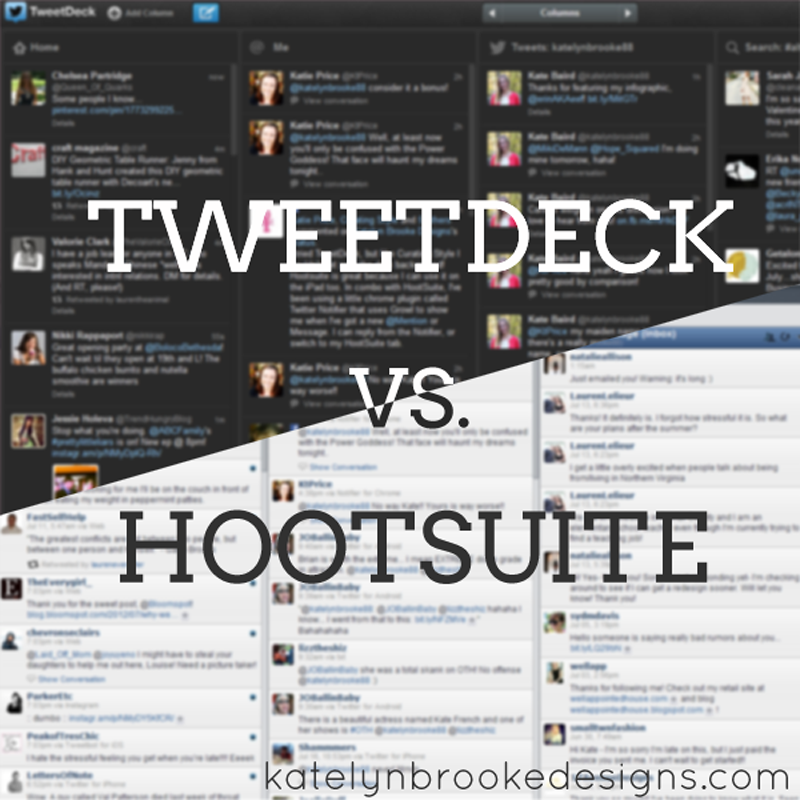 Here is a great in-depth analysis of Tweetdeck vs. Hootsuite, in case you’re looking for something I didn’t address here. There was also an awesome discussion about it on my Facebook page, make sure you check out what everyone said! Do you use a Twitter client? Is there a tool that I didn’t mention? I’d love to hear about it! Thanks for sharing this comparison, Kate! I had never heard of justunfollow, but will be checking it out momentarily. 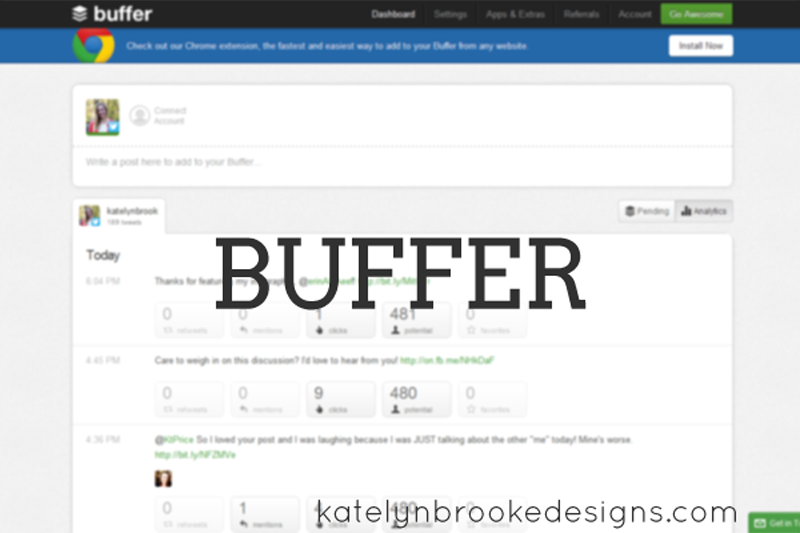 Buffer sounds interesting too. I’ve never scheduled a tweet, but can see how that would be useful. No problem, thanks for your input on my Facebook page! I love scheduling tweets- it’s hard for me to remember to do it sometimes, so it’s nice to schedule them all at once so that I don’t have to worry about it. Thank you for the comparison! I use MetroTwit, but its only for Windows, which a lot of people dislike. I’ve never heard of that one before! That’s interesting, thanks for sharing! Just an FYI you can change Tweetdeck’s background colors under settings. They even have a button titled “light theme.” That’s what I use. But you can create any color combo you want. Yeah, I had someone else tell me that- but what I use doesn’t have that option, so I just kept it up there. I think it might be the difference between using the app and logging into the site? I’m not sure!